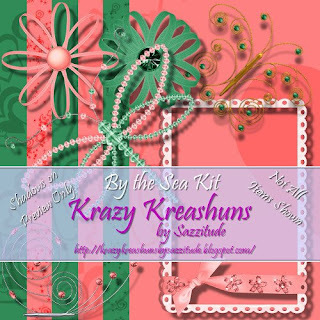 Krazy Kreashuns by Sazzitude: My 1st Freebie! Ok so i'm not much on the blog/diary type of thing. As promised to Jillann in return for a custom blinkie, here is my 1st scrap kit. It's called By the Sea and the colors were inspired by my good friend Melinda. This is a tagger size kit. Please be sure to leave some love! Way to go Sazz! I am off to post it on my blog! Fabulous! I can't wait to get a moment to play! Great job Sazz! I am going to add your link to my blog. YOUVE BEEN TAGGED! VISIT MY BLOG FOR DETAILS! Thank you! Your blog post will be advertised on the DigiFree Digital Scrapbooking Freebie search engine today (look for timestamp: 02 Jul [LA 02:14am, NY 04:14am, UK 09:14am, OZ 07:14pm]). Huggss Sazz- I dont know if you can , while on dial up- post an Award or not but I have an award for you on my blog- http://moondancerscreations.blogspot.com . Its a true award- because I do love your blog. I'm going to snag your blinkie if you dont mind and add to my blog. Hugs your way. God Bless .